Southern resident orcas that frequent Puget Sound may not survive without breaching the Lower Snake River dams to help the salmon the orcas live on, scientists say. Leading killer-whale scientists and researchers are calling for removal of four dams on the Lower Snake River and a boost of water over the dams to save southern resident killer whales from extinction. The scientists sent a letter Monday to Gov. Jay Inslee and co-chairs of a governor’s task force on orca recovery. The whales need chinook — their primary prey — year round, scientists state in their letter, and the spring chinook runs in particular returning to the Columbia and Snake are among the most important. That is because of the size, fat content and timing of those fish, making them critical for the whales to carry them over from the lean months of winter to the summer runs in the Fraser River, the scientists wrote. To join the conversation, text the word ORCA to 206-429-4613 or enter your cellphone number below. 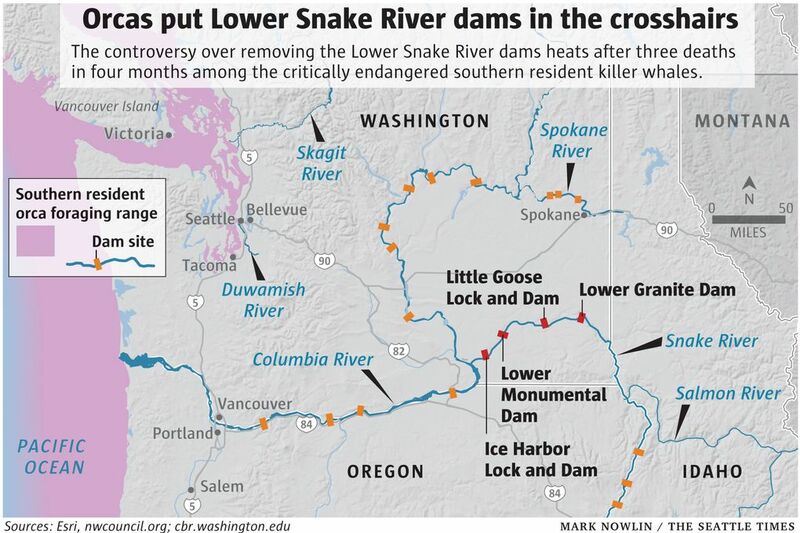 Based on the science and the urgency of the current threats confronting the southern residents, the scientists recommended two top priorities for the task force in its recommendations for orca recovery: Immediately initiate processes to increase the spill of water over the dams on the Columbia and Snake, to create more natural river conditions, and to breach the Lower Snake River dams. The letter comes as the death of three southern resident orcas in four months last summer, one from L pod and two in J pod, have added fuel to the long running-campaign to free the Snake. Lower Snake River dam removal has been debated in the region for decades as a way to boost salmon runs. 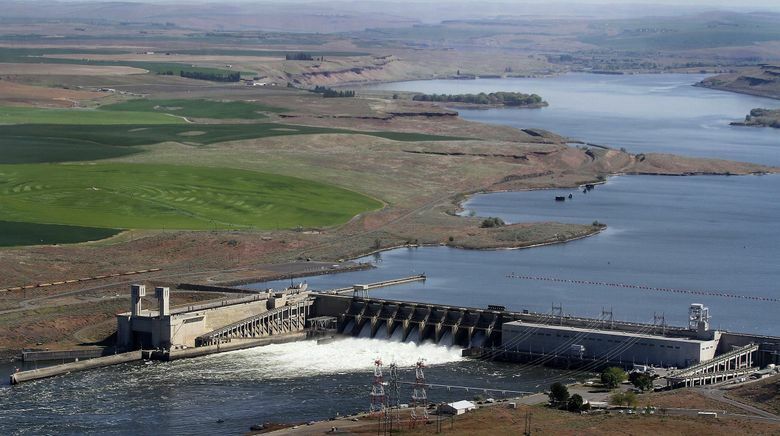 Three federal judges in a row in five rulings since 1994 also have called for an overhaul of hydropower operations by federal agencies at eight dams on the Columbia and Snake rivers to boost salmon survival, including a serious look at dam removal. The latest court review now underway will not be concluded until 2021. However, the scientists called for urgent action now because the orcas are continuing to decline and need food. “Orca need more chinook salmon available on a year-round basis as quickly as possible,” the scientists wrote. As orca advocates joined forces with dam busters, BPA has pushed back. In a recent press briefing, BPA managers said the Columbia and Snake produce only some of the fish the orcas use, and that the four Lower Snake River dams are important to the region. The whales depend on chinook from rivers all over Puget Sound as well as the from the Fraser, Columbia and Snake rivers, a recent listing of fish runs important to the whales shows. The first 15 salmon stocks on the priority list include fall, spring and summer Chinook salmon runs in rivers spanning from British Columbia to California, including the Fraser, Columbia, Snake and Sacramento rivers, as well as several rivers in Puget Sound watersheds. Columbia and Snake rivers were once the biggest chinook producers in the world, but recovery efforts have been a long struggle. Hatchery chinook recently have been surging, data from the National Oceanic and Atmospheric Administration shows. Yet even good returns are a fraction of historic numbers. Wild runs have remained far below the level of adult returns required for recovery — let alone to prevent extinction. Signing the letter were Sam Wasser, director of the Center for Conservation Biology at the University of Washington, and Deborah Giles, who is resident scientist at the University of Washington Friday Harbor Labs and the science and research director for the nonprofit Wild Orca. Their research shows a steady increase in mortality and orca pregnancy failure due to lack of adequate food. Today the orca population among the southern residents stands at just 74 individual whales — a 35-year low. Also signing the letter was David Bain, chief scientist for the nonprofit Orca Conservancy, and Katherine Ayers and other scientists whose work has documented that vessel noise disrupts orca feeding. That disruption, as well as toxins in the food chain, are more harmful to orcas when they do not have enough food, because the orcas when hungry metabolize the toxins stored in their fat. The letter comes as the governor’s task force on orca recovery is set to convene one of its last meetings before making its recommendations to Gov. Jay Inslee, due Nov. 16. The meetings are scheduled for all day Wednesday and Thursday at the Tacoma Landmark Convention Center at 47 St. Helens Ave., in the Plaza Grand Ballroom. The agenda includes three hours scheduled for public testimony between 5 and 8 p.m. on Wednesday. A summary of public comments shows a bigger consensus for Lower Snake River Dam removal than for any other action considered for orca recovery.